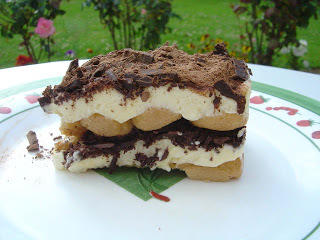 Here is the traditional recipe of tiramisu. The main ingredient is patience: To grate the chocolate, to bring all the ingredients together, and to let the tiramisu rest for 4 hours without eating it. But it is worth it! And if you want to be more original, click here for other versions of this recipe. Beat the egg yolks with 50 g sugar, until the mixture gets white. Add the amaretto, stir well, and the mascarpone little by little. Add a pinch of salt to the egg whites and beat them until stiff. (Remember, it is ready when you can put the bowl upside down and the eggs don't fall). Pour little by little the rest of the sugar, keep beating until the mixture is firm again. Add them little by little to the other mixture. Pour the coffee in a plate and soak the ladyfinger cookies. Place them in the bottom of a dish, they must cover it all. Pour half the cream. Cover with grated chocolate and some cocoa. Repeat the procedure. Finish with a layer of coca. Store at least 4 hours in the fridge. Some ideas: you can use a large dish or several verrines. It's much easier (and more elegant) to serve verrines than to cut slices in a dish. It is also better to serve the tiramisu the day after. The perfumes are stronger. So, don't hesitate to prepare it the day before you plan to serve it.